Biliverdin is a green tetrapyrrolic bile pigment, and is a product of heme catabolism. It is the pigment responsible for a greenish color sometimes seen in bruises. Biliverdin results from the breakdown of the heme moiety of hemoglobin in erythrocytes. Macrophages break down senescent erythrocytes and break the heme down into biliverdin, which normally rapidly reduces to free bilirubin. Biliverdin is seen briefly in some bruises as a green color. In bruises, its breakdown into bilirubin leads to a yellowish color. Biliverdin has been found in excess in the blood of humans suffering from hepatic diseases. Jaundice is caused by the accumulation of biliverdin or bilirubin (or both) in the circulatory system and tissues. Jaundiced skin and sclera (whites of the eyes) are characteristic of liver failure. While typically regarded as a mere waste product of heme breakdown, evidence that suggests that biliverdin — and other bile pigments — has a physiological role in humans has been mounting. Bile pigments such as biliverdin possess significant anti-mutagenic and antioxidant properties and therefore may fulfil a useful physiological function. Biliverdin and bilirubin have been shown to be potent scavengers of peroxyl radicals. They have also been shown to inhibit the effects of polycyclic aromatic hydrocarbons, heterocyclic amines, and oxidants — all of which are mutagens. Some studies have found that people with higher concentration levels of bilirubin and biliverdin in their bodies have a lower frequency of cancer and cardiovascular disease. It has been suggested that biliverdin — as well as many other tetrapyrrolic pigments — may function as an HIV-1 protease inhibitor as well as having beneficial effects in asthma though further research is needed to confirm these results. There are currently no practical implications for using biliverdin in the treatment of any disease. Biliverdin is an important pigment component in avian egg shells, especially blue and green shells. Blue egg shells have a significantly higher concentration of biliverdin than brown egg shells. Along with its presence in avian egg shells, other studies have also shown that biliverdin is present in the blue-green blood of many marine fish, the blood of tobacco hornworm, the wings of moth and butterfly, the serum and eggs of frogs, and the placenta of dogs. With dogs this can lead, in extremely rare cases, to the birth of puppies with green fur; however, the green colour fades out soon after birth. In the garfish (Belone belone) and related species, the bones are bright green because of biliverdin. Biliverdin is also present in the green blood, muscles, bones, and mucosal lining of skinks of the genus Prasinohaema, found in New Guinea, and in a number of other reptiles, in particular arboreal snakes, and members of the Varanidae. It is uncertain whether this presence of biliverdin is an ecological or physiological adaptation of any kind, but green blood that gives terrestrial animals a green color seems to occur nearly exclusively in species that inhabit green vegetation, which is highly suggestive at the least. It has been suggested that accumulation of biliverdin might deter harmful infection by Plasmodium malaria parasites, although no statistically significant correlation has been established. The Cambodian frog, Chiromantis samkosensis, also exhibits this characteristic along with turquoise bones. In a complex with reengineered bacterial phytochrome, biliverdin has been employed as an IR-emitting chromophore for in vivo imaging. In contrast to fluorescent proteins which form their chromophore through posttranslational modifications of the polypeptide chain, phytochromes bind an external ligand (in this case, biliverdin), and successful imaging of the first bacteriophytochrome-based probe required addition of the exogenous biliverdin. Recent studies demonstrated that bacteriophytochrome-based fluorescent proteins with high affinity to biliverdin can be imaged in vivo utilizing endogenous ligand only and, thus, with the same ease as the conventional fluorescent proteins. Advent of the second and further generations of the biliverdin-binding bacteriophytochrome-based probes should broaden the possibilities for the non-invasive in vivo imaging. A new class of fluorescent protein was evolved from a cyanobacterial (Trichodesmium erythraeum) phycobiliprotein, α-allophycocyanin, and named small ultra red fluorescent protein (smURFP) in 2016. smURFP autocatalytically self-incorporates the chromophore biliverdin without the need of an external protein, known as a lyase. Jellyfish- and coral-derived fluorescent proteins require oxygen and produce a stoichiometric amount of hydrogen peroxide upon chromophore formation. smURFP does not require oxygen or produce hydrogen peroxide and uses the chromophore biliverdin. smURFP has a large extinction coefficient (180,000 M−1 cm−1) and has a modest quantum yield (0.20), which makes it comparable biophysical brightness to eGFP and ~2-fold brighter than most red or far-red fluorescent proteins derived from coral. smURFP spectral properties are similar to the organic dye Cy5. ^ a b c Mosqueda, L; Burnight, K; Liao, S (2005). "The Life Cycle of Bruises in Older Adults". Journal of the American Geriatrics Society. 53 (8): 1339–1343. doi:10.1111/j.1532-5415.2005.53406.x. PMID 16078959. ^ Seyfried, H; Klicpera, M; Leithner, C; Penner, E (1976). 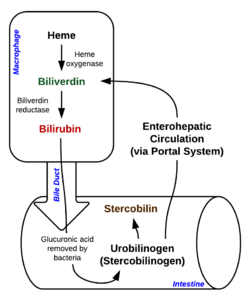 "Bilirubin metabolism (author's transl)". Wiener Klinische Wochenschrift. 88 (15): 477–82. PMID 793184. ^ a b c Bulmer, AC; Ried, K; Blanchfield, JT; Wagner, KH (2008). "The anti-mutagenic properties of bile pigments". Mutation Research. 658 (1–2): 28–41. doi:10.1016/j.mrrev.2007.05.001. PMID 17602853. ^ a b c d Ohrui, T; Yasuda, H; Yamaya, M; Matsui, T; Sasaki, H (2003). "Transient relief of asthma symptoms during jaundice: a possible beneficial role of bilirubin". The Tohoku Journal of Experimental Medicine. 199 (3): 193–6. doi:10.1620/tjem.199.193. PMID 12703664. ^ McPhee, F; Caldera, PS; Bemis, GW; McDonagh, AF; Kuntz, ID; Craik, CS (1996). "Bile pigments as HIV-1 protease inhibitors and their effects on HIV-1 viral maturation and infectivity in vitro". The Biochemical Journal. 320 (Pt 2): 681–6. doi:10.1042/bj3200681. PMC 1217983. PMID 8973584. ^ Halepas, Steven; Hamchand, Randy; Lindeyer, Samuel E. D.; Brückner, Christian (2017). "Isolation of Biliverdin IXα, as its Dimethyl Ester, from Emu Eggshells". Journal of Chemical Education. 94 (10): 1533–1537. doi:10.1021/acs.jchemed.7b00449. ^ Fang, LS; Bada, JL (1990). "The blue-green blood plasma of marine fish". Comparative Biochemistry and Physiology B. 97 (1): 37–45. doi:10.1016/0305-0491(90)90174-R. PMID 2253479. ^ "These Puppies Were Born with Green Fur". ^ Austin, C; Perkins, S (2006). "Parasites in a biodiversity hotspot: a survey of hematozoa and a molecular phyolgenetic analysis of plasmodium in New Guinea skinks". Journal of Parasitology. 92 (4): 770–777. doi:10.1645/GE-693R.1. PMID 16995395. ^ Lee Grismer, L.; Thy, Neang; Chav, Thou; Holden, Jeremy (2007). "A New Species of Chiromantis Peters 1854 (Anura: Rhacophoridae) from Phnom Samkos in the Northwestern Cardamom Mountains, Cambodia". Herpetologica. 63 (3): 392–400. doi:10.1655/0018-0831(2007)63[392:ANSOCP]2.0.CO;2. ^ a b X. Shu; et al. (2009). "Mammalian expression of infrared fluorescent proteins engineered from a bacterial phytochrome". Science. 324 (5928): 804–807. doi:10.1126/science.1168683. PMC 2763207. PMID 19423828. ^ a b G.S.Filonov; Piatkevich, Kiryl D; Ting, Li-Min; Zhang, Jinghang; Kim, Kami; Verkhusha, Vladislav V; et al. (2011). "Bright and stable near infra-red fluorescent protein for in vivo imaging". Nat Biotechnol. 29 (8): 757–761. doi:10.1038/nbt.1918. PMC 3152693. PMID 21765402. ^ a b Rodriguez, Erik A.; Tran, Geraldine N.; Gross, Larry A.; Crisp, Jessica L.; Shu, Xiaokun; Lin, John Y.; Tsien, Roger Y. (2016-08-01). "A far-red fluorescent protein evolved from a cyanobacterial phycobiliprotein". Nature Methods. 13 (9): 763–9. doi:10.1038/nmeth.3935. ISSN 1548-7105. PMC 5007177. PMID 27479328. This page was last edited on 22 February 2019, at 02:48 (UTC).